Compensation is the largest expense that a firm incurs. And yet, few firms really manage it well. The trick is realizing it is more complex than just splitting the pie. The crucial issues of compensation and performance are inextricably linked. In this important resource, experts August Aquila and Coral Rice offer a unique perspective on how you can align your compensation and performance management plans in order to boost performance, maximize profits, and keep both your staff and clients happy. 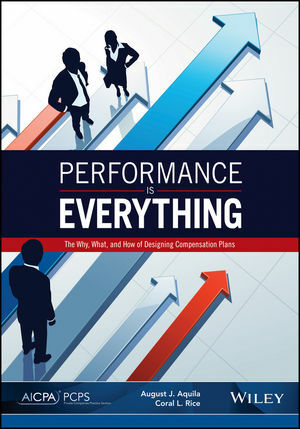 This companion to Aquila and Rice’s successful AICPA publication, Compensation as a Strategic Asset, will pick up where that guide left off, offering readers the “Why, What, and How” for compensation plans filtered through the lens of performance management. Ultimately, this guide is based on what other firms are doing, and let's you know why it’s working or why it’s not. By guiding you through a process and providing you with the tools to design a partner and staff compensation plan, Performance Is Everything will help you develop the plan that works for your firm. August J Aquila, an internationally known consultant, speaker, and author, has held leading positions in the accounting profession for more than 25 years. He currently heads AQUILA Global Advisors, LLC, a full-service consulting firm to accounting and other professional services firms. Coral L. Rice is one of the accounting profession’s top consultants and executive coaches in the areas of organizational development, compensation, and learning. She serves as a global senior consultant in FranklinCovery’s 4 Disciplines of Execution practice and has served both Fortune 100 and smaller clients in a variety of consulting roles.